2. How far your Ultimate is charged. 3. Your damage done overall. 4. Your healing done overall. - Disable Interface Volume (Settings > Audio > Interface Volume) to get rid of the map ping sound. - You need to have the same map active as your group members to see correct values. In zones like Cyrodiil that have submaps it can happen, that your active map doesn't update on it's own (for example after you port away from your Alliance's home bas). The addon will post a warning to your chat, so in that case open the map to make sure you have the right map active. Step 1: Select what Ultimate you are using in the settings. Step 2: Select what Ultimates you want to track. 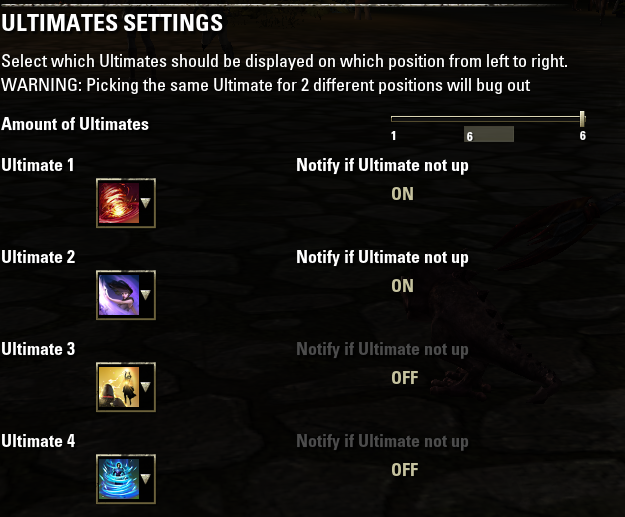 In the settings you can select up to 6 ultimates that you want to track. For each ultimate you see which player has this ultimate charged how far, sorted by how far it is charged. 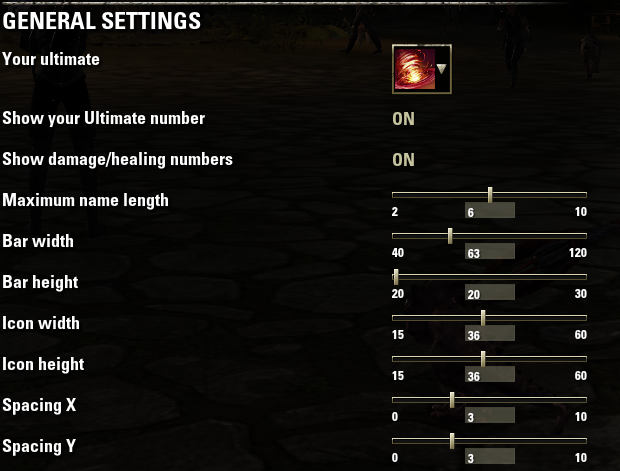 In the settings you can adjust how many ultimates you want to track, how big the icons should be and how big the bars should be. 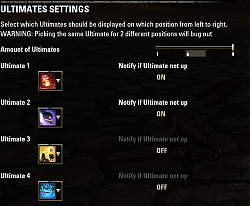 Display at what position you are in the list of your selected ultimate. This way, you can easily see if it's your turn to use your ultimate yet or not. Can be disabled in the settings. Displays a warning when of this specific ultimate, none is ready. This option is mostly interesting for group leaders as during the fight you often won't realise that you have no negate up, etc. The left row is damage done, the right row is healing done. The numbers might be occasionally jumping weirdly, especially when it's laggy, however it will correct itself at some point. Can be hidden in the settings. In order to reset the numbers, the group leader has to type "S#? ?2" into group chat. Does this addon still work? 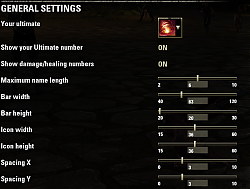 In the dropdown menu for each addon in the settings menu, all I see is a question mark and Healing Thicket as the only available items to track. Please help asap. 3. pls use zo_strformat for "Notify if Ultimate not up" messages on screen. otherwise de/fr players see "Auge der Flammen^n"
Last edited by Scootworks : 01/01/18 at 04:13 PM. Hello, I really like the addon, I have a question though. Is it possible to show the charge of the bar even if you are not in a group? So please let me know if there is a way to enable a charing bar while you are not in a group. Thank you. The addon is communicating via map pings, currently the game doesn't allow to ping when you aren't in a group. If you have an offline person in group while you solo, it should still work tho. 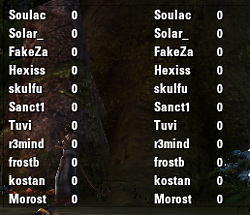 Thank you very much for sharing this addon, Sanct. It is a very fair move of you guys.